As Microsoft prepares to launch Office 2010, the latest version of its venerable productivity suite, Google is persuading longtime Office users to ditch Redmond's apps and upgrade to Google Docs instead. A pitch posted Tuesday on the Official Google Enterprise Blog outlines the alleged advantages of Google Docs, a Web-based office suite with word-processing, spreadsheet, and presentation tools that has been around for four years. Google Docs offers strong collaboration features, an important component for enterprise customers, but its browser-based productivity apps can't match the features and polish of the two-decade-old MS Office. "For example, you can store any file - including Microsoft Office documents - in Google's cloud and share them in their original format," writes Google Enterprise Product Management Director Matthew Glotzbach. He adds that his company's recently acquired DocVerse technology will enable real-time collaboration directly in Office 2007 and 2003. 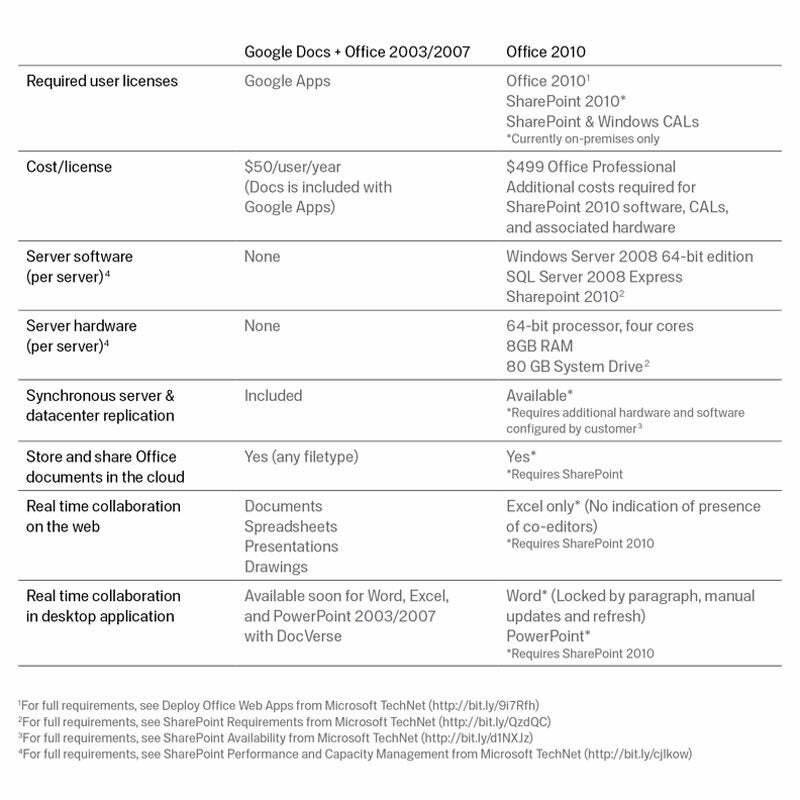 Here's a Google chart of Docs' alleged advantages over Office. Yes, it's one-sided, but that's to be expected. Note the cost advantages of Google Docs, which may be its strongest selling point in today's economy. Recently both the Oregon Department of Education and the City of Los Angeles--two cash-strapped government agencies--announced plans to migrate to Google Docs. Microsoft isn't taking Google's marketing blitz lightly. To counter the cloud-based threat, the company is preparing to launch a new suite of Web-based versions of Word, Excel, PowerPoint, and OneNote. However, as PC World's Yardena Arar notes in her review of Office 2010, Microsoft's online apps offer limited collaboration when compared with Google Docs and other cloud-based suites. Redmond has also lowered the price of Office 2010. For instance, Office 2007 Standard Edition, which includes Word, Excel, PowerPoint, and Outlook, originally cost $399. By comparison, Office 2010 Home and Business, which includes those four apps plus OneNote, is priced as low as $199. Google's argument, which centers on cost savings and the convenience of cloud-based collaboration, is a compelling one. Question is, will Docs manage to grab a sizable chunk of Office's enterprise market?